One of the things that I'm beginning to feel the loss of, just a little bit, is the odd little alcoholic drink at the weekend. Or on a day when it seems like a little glass in celebration would be a good idea - Gove being kicked out of office demoted promoted to chief whip this week was definitely one of those days. Even if I'm not convinced about Nicky Morgan and the reasons for her appointment - but that's for another place. As it is warmer now, there are tempting adverts with images of cider and while I'm struggling very much to keep cool in this heat at seven months pregnant these are difficult to ignore. I do like a good chilled cider in the summer... or a crisp glass of Verdicchio. But... seven months pregnant and so I won't. I struggle to keep hydrated as it is, so anything that might lead to needing to drink even more is not a good idea. I did have one glass of wine when I was pregnant with D on Christmas Day but it lasted most of the day because I didn't really enjoy it. 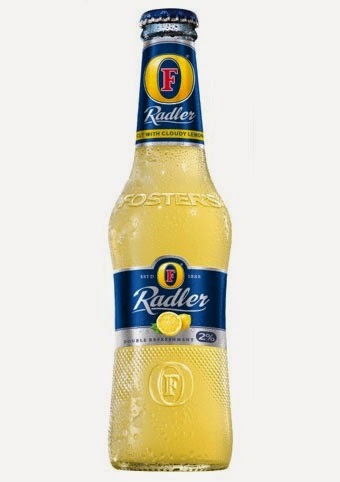 Foster's Lemon Radler. Although this link doesn't show it, this is available as a 2% ABV or alcohol-free. I was quite excited about this - I LOVE cloudy lemon. I'm very much addicted to San Pelligrino's Limonata as the mixture of ice cold, sweet and sour is just what my palate wants. What it doesn't want is something that tastes a bit like washing up liquid. A bit rancid. Lacking the crisp texture I had hoped for. I still have three bottles left and absolutely no idea what to do with them. Kopparberg alcohol free pear cider. I heard good things about this and I was all ready to enjoy it. I love perry with it's slightly novel, slightly woody taste. Unfortunately, I found this tasted a bit flowery for me. It wasn't entirely unpleasant like the Radler but I bought two about a month ago and the second still sits in the fridge waiting attention. Becks Blue (apologies for this not being a direct link to the website. The Becks website is rubbish...). I'll preface this by saying I don't like lager... except for the odd Peroni anyway. For some reason though, I had a major hankering for it in the first trimester. To me, it tastes like a lager and is pretty thirst-quenching. On a practical level, it's the smallest of all of the drinks available, so fits our overloaded fridge well and per unit, it's the cheapest. 7/10. If you like lager, you're likely to get on board with this. Finally, Kopparberg's alcohol free Mixed Fruits . This is utterly delicious. I can happily chug the whole can in a minute or two. It comes in two sizes, bottles or cans. Cans are available from Asda and bottles from Morrisons, Sainsburys or Tesco. I don't know how best to describe it, other than a bit like Vimto but less sickly-sweet. 9/10. I'd still like the sweetness toned down just a touch. Interestingly, when I am drinking alcohol, I avoid Kopparberg as I find it too sweet. I'm more of a dry cider kind of girl. This is not a sponsored post - I purchased all products mentioned in this review.